What are the potential impacts of shale gas? Tension exists between improved energy security and other potential benefits of UK shale gas development, and the environmental risks and possible adverse impacts of shale gas on achievement of a low carbon economy. At this early stage of development, it is difficult to predict the extent to which these impacts will affect the UK. Security of energy supply is an issue facing many countries. The UK situation is one example of how shale gas could help address security of supply challenges. 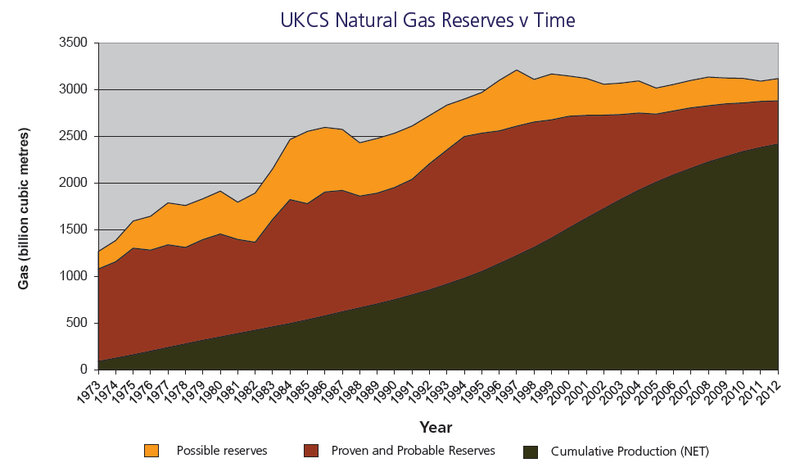 The UK is now facing a decline of domestic conventional gas reserves and a corresponding fall in production. Production of natural gas from the UK Continental Shelf (UKCS) has been decreasing by 9.2% on average per annum since 2000 (see chart below). Since then, Liquified Natural Gas (LNG) and pipeline gas imports have been increasing and, by 2019, it is expected that they will account for 69% of UK gas supply. In 2012, about 65% of total gas consumed was imported. Any indigenous energy source has the potential to enhance the UK’s self-sufficiency in energy, whilst also increasing the diversity of supply. Domestic UK shale gas production could potentially contribute to both of these aims. This could also have implications for the economic aspects of supply security, such as minimising the import payments for fuel. The graph below shows the evolution of natural gas and oil prices since 1998. Global prices have diverged since the late 1990s. This is due to a number of different factors. 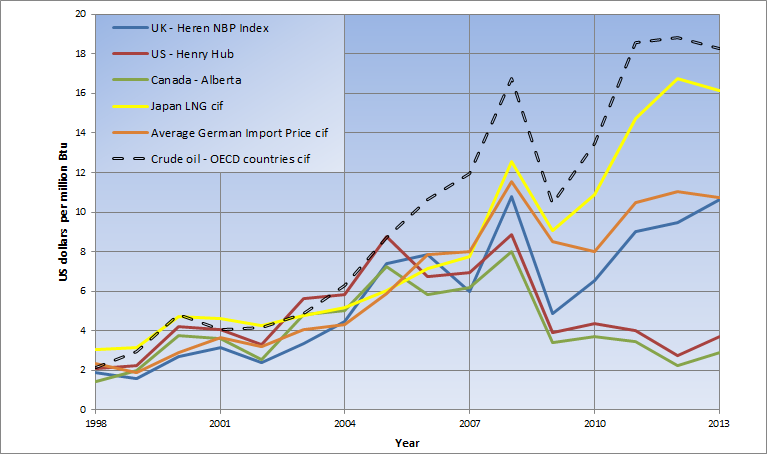 For example, the high Japanese LNG price is due to its reliance on imported gas. The low North American gas prices are closely related to low export capacity and high indigenous supply. The UK and Europe have a high import/export capacity, making prices similar across Europe. This trading capacity limits the UK’s ability to price differently from the rest of Europe. For this reason, additional UK gas production is likely to only have a modest effect on these internationally-set gas prices. In addition, global demand for gas is expected to increase, which could further limit any reduction of the price of gas in the UK. At this stage, not enough is known about UK shale gas resources to clearly define the impacts they would have across the economy. For example, the chemical composition of the natural gas can be important for petrochemical feedstocks and the industries that use them. One example of a petrochemical with potential to be impacted by shale gas production is ethylene, a basic chemical used in thousands of everyday products such as plastic bags, milk cartons, insulating material, antifreeze, toys and car components. Ethylene can be derived from crude oil or natural gas through different chemical processes. Natural gas of the correct composition is a more efficient feedstock for ethylene production than other hydrocarbon feedstocks; therefore, increased supply could lower the cost of ethylene production. As yet, the composition of the UK’s shale gas is unknown, and therefore the potential impact on ethylene production and other areas of the manufacturing sector is uncertain. Job creation is likely to result from shale gas exploration and production stages in the UK. The number of potential jobs will vary depending on several factors, therefore figures are uncertain at this stage. According to one DECC report, the number of full time equivalent positions created (including direct and indirect staff) would range from 1,100 to 4,200 during the first year, reaching a peak of between 2,600 and 32,000 after six or seven years. Other estimates put the peak figure above 64,000. This is projected to gradually decline over the following few years. The UK government has proposed that local authorities should receive a large portion of business tax raised from shale gas projects. It is the government’s intention that operators will provide at least £100,000 of benefits per fractured well site during the exploration phase, and no less than 1% of overall revenues, to local authorities. The first UK hydraulic fracturing operation in Lancashire induced a number of small tremors (top local magnitude values of 1.5 and 2.3 - Source: BGS), but no surface damage was reported. Similar magnitude tremors occur during coal mining, oil and gas field depletion, filling of large water reservoirs, and deep geothermal energy projects. - conduct a prior review on seismic risk and submit a plan showing how this is to be addressed. - monitor seismic activity before, during and after hydraulic fracturing. - implement a ‘traffic light’ system to identify unusual seismic activity requiring the reassessment or halting of operations. By way of comparison, a small UK supermarket receives approximately 3 - 6 deliveries per day, while a large supermarket may receive between 4 - 20 deliveries daily, depending on a range of factors. The natural gas produced from shale needs to be transported from the well pad to a pipeline network. In the UK, existing network arrangements for gas entry to the National Transmission System and Distribution Network will apply. The vehicle movement numbers in the table include the number of water trucks needed to deliver water to the site. Instead of trucks, pipelines can also be used to transfer water to drill sites. This reduces the truck trips required, but could impact the cost. The main hazard at every well site is the potential for uncontrolled release of hydrocarbon gas due to a failure of the well structure, which may then reach a source of ignition leading to a fire or explosion. 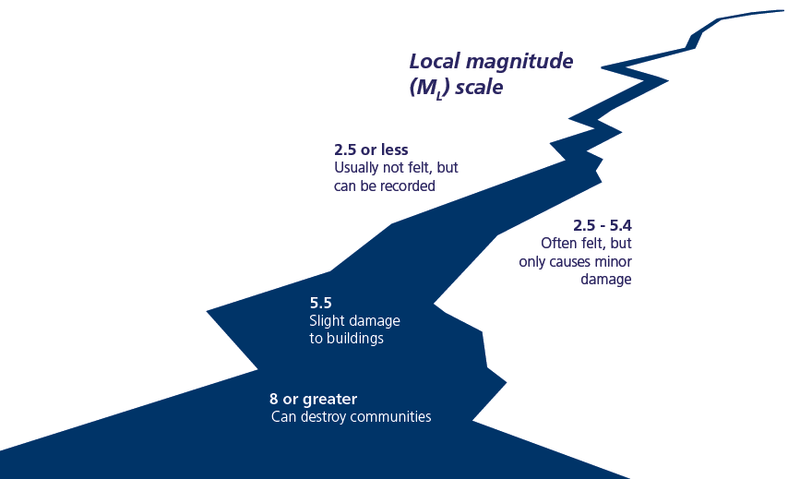 The level of risk varies, depending on how quickly and easily any release can be controlled, and on geological conditions. Where there is a loss of well integrity, there is also the possibility of fracturing fluids or produced water being released to the surrounding rock strata or to the surface, which may have health or environmental consequences depending on the location of water aquifers. A well-designed and constructed well will help to reduce the risks of a release of fluids or gas to as low as is reasonably practicable. For shale gas operations, the UK Health and Safety Executive (HSE) regulates to ensure that wells are properly designed, constructed, operated, maintained, and ultimately abandoned to ensure that the flow of fluids in the well, including fracturing fluids and produced gas or water, are controlled and stay within the well. Companies are also required by the HSE to employ an independent examiner (separate from the immediate line management of the well operator), to assess well design, construction, operation and maintenance. The well examination scheme and involvement of the well examiner continues for the complete lifecycle of the well, from design to final plugging and decommissioning. Venting can occur during well completions, including post-hydraulic fracturing, flowback of fracturing fluids, and as part of equipment maintenance operations. However, this will not be permitted in the UK where all operators will be required to flare or capture any vented gas. This type of emission may occur as leaks in pipelines, valves, or seals, either accidentally (e.g. from corrosion or physical damage), or from equipment design (e.g. rotating seals). Clear guidelines exist in the UK to control and minimise these emissions. This equipment might include pipelines, gas processing plants, compressors, pressurised tanks, or well isolation equipment. The effectiveness of burning gas in flares varies according to wind and other conditions, and is typically no better than 98% (a similar effect can be seen when starting a gas stove: it can take a few seconds before a steady flame is established). In the UK, flaring and combustion systems must be approved by the appropriate regulatory body. The majority of potential methane emissions could theoretically be controlled by implementing improved industry-wide methane-capture technology. This includes safety procedures, applications and equipment (e.g. reduced emissions completions or ‘green completions’). These technologies are currently being installed by operators in the US. Conventional production methods also have to manage these potential emission risks. Processing, compression and transportation challenges are common to conventional and unconventional gas. Good practices for environmental management backed up by strong regulation and high quality data are necessary to understand background levels, set baselines for, and mitigate potential methane emissions. When evaluating the potential impacts of shale gas development on water resources, the main aspects to consider are water resource requirements, water quality, and wastewater management. In the UK, the estimate of water needed over the lifetime of each well will vary depending on shale formation depth, geology and other parameters. This will range from 1.6 to 6 million gallons (7,250m3 to 27,000m3) (BGS estimates). As a reference, an Olympic swimming pool has a capacity of around 0.55 million gallons (2,500m3) of water. - surface spillages of chemicals, diesel, flowback fluids, and other materials at a drilling site. - poor well design and construction with subsequent failure and subsurface release of contaminants.